John will cover the history of the Arid Lands Botanic Garden since he first proposed the establishment of the Garden in 1981, development of the Garden, the role of the “Friends” support group and the status of the Garden today. 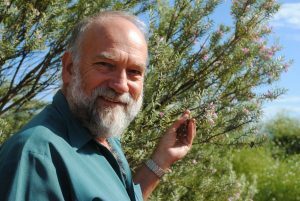 John is an experienced horticulturist with broad knowledge of ornamental horticulture in South Australia, particularly in the arid zone, and a passion for plants and gardening. Trained at the Botanic Gardens of Adelaide, worked at Leigh Creek as horticultural adviser and then moved to PNG as Curator of the National Botanic Garden of Papua New Guinea in Lae. Returned to SA and established the Parks & Gardens Dept for the Port Augusta City Council. Awarded a Churchill Fellowship in 1978 & studied arid zone amenity horticulture in Chile, Bolivia, Peru, USA, Israel, Namibia & South Africa. Instigated the Australian Arid Lands Botanic Garden at Port Augusta in 1981 & still very involved with this project. Moved to Roxby Downs in 1987 to work as horticulturist and then senior environmental scientist. After 18 years in these roles moved to Adelaide and worked at Mount Lofty Botanic Garden, before accepting a lecturing position at TAFE SA Urrbrae Campus for 12 years until retirement in March 2018.